Doing my part to give companies a hand when deciding what name to put on their brand. Here's another one I like. Not only is is punny but it accurately reflects what the product's all about -- the pursuit of all things trivial. 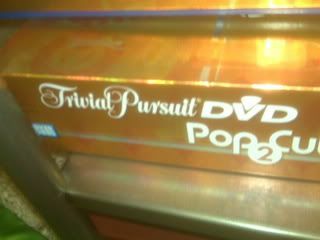 For a while, Trivial Pursuit was the kleenex of the trivia category. They've managed to stay relevant though with new editions like this Pop Culture DVD game. It all goes to show, that when choosing a brand name, there's nothing trivial about it! What started with a simple URL obsession has blossomed into a brand breakdown. As a marketing professional, my day job requires me to be a brand vigilante. For some reason, I decided to devote my nights and weekends to that same pursuit. So join me here as I set out to put my stamp of Good or Bad on every brandished brand that flashes before my eyes (and camera lens). My name is Aaron Goldman and I'm a marketing junkie. My day job is CMO at Kenshoo, a global technology platform for managing online advertising campaigns. So, yes, I have a vested interest in Good and Bad Brands. Please note: I'm a marketing guy, not a lawyer. I am not aware of any copyright laws I'm violating by posting pictures of brands that are in the public domain to this blog. That said, if you own the rights to anything I've posted and feel that I am infringing on your copyright, please contact me and I will remove any offending material promptly.